Discover the secrets of achieving a close connection and unbreakable bond with your horse. Lynn shares the concepts and exercises she uses to change untrained and special-needs horses into reliable confident partners. Learn the nature and process of creating an amazing relationship with a horse. 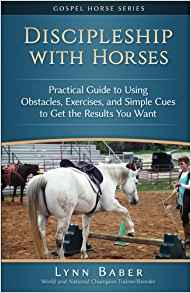 Presented in easy-to-understand concepts and exercises to create levels of communication and relationship with a horse most only dream of. You'll be able to connect the center of a round pen to the heart of a horse. Have you witnessed a connection between horse and rider that defies explanation? How can a child and her pony communicate without words? Transformative relationship with a horse is possible if you know how to offer it and are committed to do what it takes. The parallel between relationship with a horse and our relationship with God follow similar paths. Christian author Lynn Baber ties the two together in inspiring and practical ways. Readers walk away with insights to increase communication with their horses and systematic exercises to practice at home. The unexpected bonus for those who create something new and rewarding with a horse find these new skills apply to most relationships - family, friends, co-workers, and God. The secrets of success are simplicity and commitment. Lynn Baber specialized in training stallions for years. As she says, the only way to get a stallion to offer his power and loyalty is to earn it. You can't fool God and you can't fool a horse. The most difficult skill to learn as an adult is simplicity. Horses know when you're bluffing and they know when you care and when you don't.